Update: Fortnite: Battle Royale will debut Thanos as a new playable character in a few hours. We'll have the first trailer and images of the Avengers villain soon. We've updated this story with the official tweet from Epic Games. Thanos is ready to commandeer Fortnite starting tomorrow, after having already conquered global box offices last month as the supervillain in Avengers: Infinity War. The 'Mad Titan' of Marvel will become a playable character Tuesday, May 8 in what's being billed as a limited-time mash-up in the game's Battle Royale mode, according to Entertainment Weekly. Epic Games says there will be Fortnite downtime in preparation for the Fortnite v4.1 update starting May 8 at 4:00am ET (8:00 GMT). Brace yourself for that (and then brace yourself again for Thanos). The 'Infinity Gauntlet Limited Time Mashup' drops 100 players onto a Fortnite map along with the six Infinity Stones so coveted in the movie. If you find all six stones, you'll transform into Thanos and wield his Infinity Gauntlet powers. 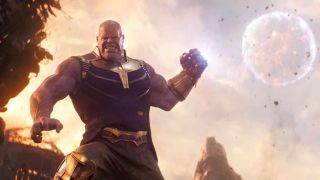 There's no timetable on how long Thanos will be a part of the Fortnite world, but the Epic Games-Marvel mash-up will be free on all Battle Royale mode-supported platforms, including PS4, Xbox One, PC, macOS and iOS 11.